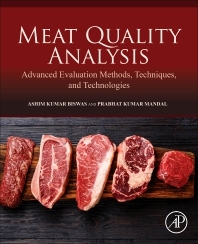 Meat Quality Analysis: Advanced Evaluation Methods, Techniques, and Technologies takes a modern approach to identify a compositional and nutritional analysis of meat and meat products, post-mortem aging methods, proteome analysis for optimization of the aging process, lipid profiles, including lipid mediated oxidations, meat authentication and traceability, strategies and detection techniques of potential food-borne pathogens, pesticide and drug residues, including antimicrobial growth promoters, food preservatives and additives, and sensory evaluation techniques. This practical reference will be extremely useful to researchers and scientists working in the meat industry, but will also be valuable to students entering fields of meat science, quality and safety. Dr. Ashim Biswas has worked in method development and quality evaluation of meat for various biochemical compounds including proteomes, meat colour, texture profiles, lipid molecules, lipid oxidation products, antimicrobial residues, pesticides, bioactive compounds and pathogen identification. Dr. Prabhat Mandal has long experience of new meat product development, food safety and quality evaluation of meat products including use of natural preservatives and functional additives including use of natural antimicrobial. Worked on analysis of various biochemical compounds, sensory evaluation, texture profile analysis and lipid oxidation products in meat products.